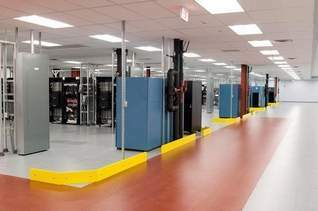 IBM Corp. has spent $30 million to renovate a facility in Poughkeepsie, N.Y. for the manufacture of its System z mainframes, according to reports. According to a story in the Poughkeepsie Journal, the “updated building has recently been put to use making the first new, but as-yet-unannounced, models for testing,” which presumably mean the z11 mainframes due out later this year. The z11s are expected to move from 65nm to 45nm processors running around 5 GHz with simultaneous multithreading resulting in a 20-25% performance improvement. The renovated 56,000-square-foot facility doesn’t mean more local jobs, just continued work, according to the story. Though a manufacturing facility, the building was rebuilt to run like a data center so that IBM could fully test the new mainframes. This article is about a big empty room (with nice airflow and plumbing) that will be used to provide a function they already do in another building somewhere on site. No added jobs, no innovation. This is not news, it is a boring planned upgrade. Yes, they spent money because they wanted an ROI somewhere. It is unlikely that the return they are looking for is the joy and happiness of the community. I would hold off on the parade in their honor until you see how solid their “commitment to the area” really is.